Little in the world of commercial insurance can be as complex or confusing as the subject of Additional Insured (AI) status. Matters related to AI have flooded the courts with disputes involving indemnity agreements, hold harmless language and certificates of insurance. There exists an implicit tug-of-war between indemnitors seeking to limit the scope of AI and the indemnitees that want maximum coverage under the policies of indemnitors. This is hardly surprising. The entire premise of risk transfer is predicated on moving the liability from one side of the table to the other. Pushback is inevitable. The right to an immediate legal defense funded by the indemnitor's carrier andem> the cost of that defense is not subject to policy limits. There are also a number of misconceptions about AI. It does not typically secure the right to receive notice of cancellation. It also does not provide the additional insured with coverage for all types of liability it might otherwise incur as part of a project. Which is better, to be an Additional Insured or an Additional Named Insured? Like so many areas of insurance, there is no accepted industry definition of what Additional Named Insured means. To some in the industry, achieving Additional Named Insured status is conveyed by an endorsement to the policy, and the difference between the two terms is found in the presence (or absence) of restrictions or limitations found in the language of the endorsement. The provisions in standard liability insurance policies do carefully differentiate between named insureds and insureds. Conditions and exclusions may be applicable to one, the other, or both. Since a named insured is an insured, any provision or exclusion that applies to the insured also applies to the named insured. However, it should not be assumed that a provision or exclusion that applies to only named insured would also apply to mere insureds. 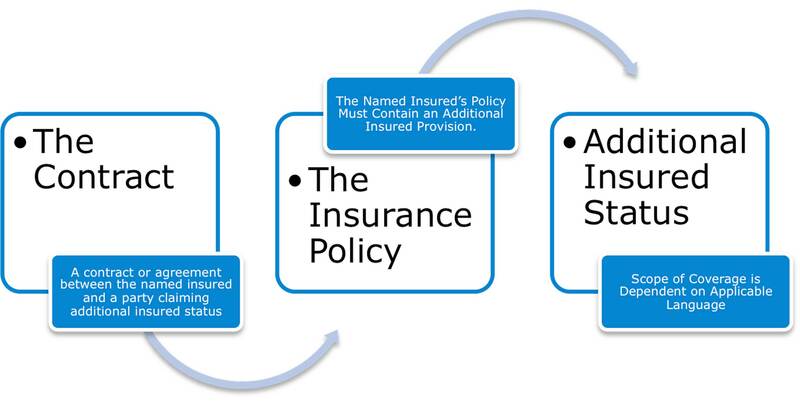 Therefore, an analysis of the differences in how the policy treats these two groups of insureds is necessary in determining which type of insured status is desirable. In most cases, the conclusion is that it is preferable to require Additional Insured status. Caution should be exercised when manuscript policies are in use. Careful review is often necessary to determine if traditional wording or exclusions are present. Since policy review is not a practical reality for most indemnitees, it remains preferable to follow the general rule and require additional insured status. It is always in the interest of the indemnitee to make certain that the underlying contract includes a well-written and enforceable indemnity clause. The indemnitee should further require this transfer be supplemented with contractual liability insurance and AI status. To back up representations made on the certificate of insurance, it is recommended the appropriate AI endorsement be required. Of course, indemnitees should always maintain their own liability insurance or risk financing program to respond only when the indemnity clause and AI status do not apply or limits have been exhausted.